Many Canadians object to multiculturalism without objecting to mass immigration and the rapid replacement of Eurocanadians by Asians, Africans, and Muslims. Criticizing multiculturalism without objecting to this replacement is hardly a risk to one's career. The controversy initiated by Neil Bissoondath's Selling Illusions: The Cult of Multiculturalism in Canada (1994) gave the author a name in Canada and a rather lucrative career along with nice honorary prizes including the Ordre national du Québec. 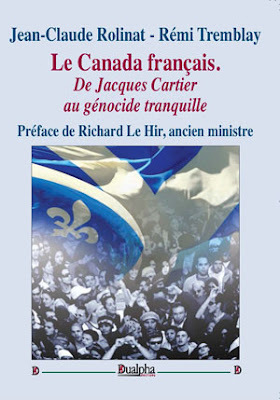 J. L. Granatstein's book Who Killed Canadian History? brought him national attention and prominent positions beyond his academic job. This should not surprised us. These two books welcome with delight the diversification of Canada. The authors merely object to the ways multiculturalism encourages immigrants to hold on to the cultural values of their former homelands rather than assimilate. We at CEC believe that multiculturalism in itself is not the problem. Mass immigration from non-European cultures is the problem. On the other hand, we agree with the multicultural argument that racial and cultural identity are important to the psychological well being of individuals and that showing preference for one's ethnic group is natural. Immigrants in large numbers will form ethnic groups regardless of whether the government endorses multiculturalism or not. Mexicans, Blacks, and Aboriginals in the United States are still separated in residential locations, voting patterns, and educational attainments even though there is no official multiculturalism. Assimilation only worked with European immigrants. It is not that there is something wrong with non-Europeans. They cannot assimilate in large numbers because the differences between them and Europeans are more substantial historically, culturally, and racially. This is what the historical and scientific evidence tells us. Demography is destiny, said Auguste Comte. Today we should know it is the ethnic distribution of a nation's population that is destiny. 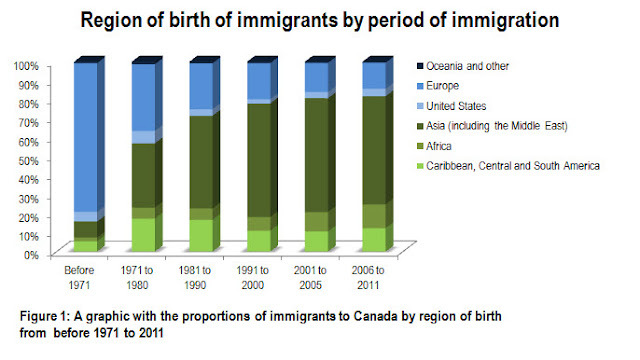 Before 1961, 90 percent of all immigrants to Canada were from the British Isles, and just 3 percent were from Asia and the Middle East. After the 1962 Regulations, the percentage from Asia, the Caribbean, and Middle East began to increase steadily. Between 1981 and 1991, the percentage from Europe declined to only 25 percent, and between 1991 and 2001 it declined further to 19.5 percent, whereas Asian immigration soared to nearly 60 percent, with immigrants from Africa, the Caribbean, and South America accounting for about 19 percent. Moreover, from the 1990s on Canada would see roughly 225,000 to 260,000 immigrants arrive each year, mostly from non-European nations. As a result, it is estimated that, by 2031, between 25 and 28 percent of the population could be foreign-born, and that, "by 2031, 47% of second-generation Canadians could belong to a visible minority group," nearly double the proportion of 24 percent in 2006. (Second generation refers to those who are Canadian-born and have at least one parent born outside Canada). By 2031 visible minority groups are estimated to comprise 63 percent of the population of Toronto, 59 percent of Vancouver, and 31 percent of Montréal. Keep in mind, moreover, that Statistics Canada defines "visible minorities" as "persons, other than aboriginal peoples, who are non-Caucasian in race or non-White in colour." If we take aboriginals into account, the projections are that between 21 percent and 24 percent of the population of Saskatchewan and between 18 percent and 21 percent of the population of Manitoba will have an Aboriginal identity in 2031. This changing demography is the context in which to ascertain in a realistic manner the growing influence of the ethnic vote in Canada. The "ethnic vote" was hardly a radical force when it began rather innocuously with the decision among Liberal officials in the mid-1970s to appeal to ethnic groups as a voting force. The proportion of immigrant minorities then was less than 4 percent. But as their numbers mushroomed, the Conservative Party under Mulroney began assessing the potential "electoral benefits that might accrue from an expansive immigration policy," reminding ethnic voters how friendly this party was to the needs of immigrants in passing the Equity Act of 1986 and the Multiculturalism Act of 1988. The Harper years (2006-2015) were marked by incessant efforts to "get the ethnic vote" through the attendance of religious ceremonies, ridiculous donning of ethnic attire, granting interviews to the ethnic press, promising to maintain an expansive immigration policy, and reiterating that Canada's identity was no longer European. 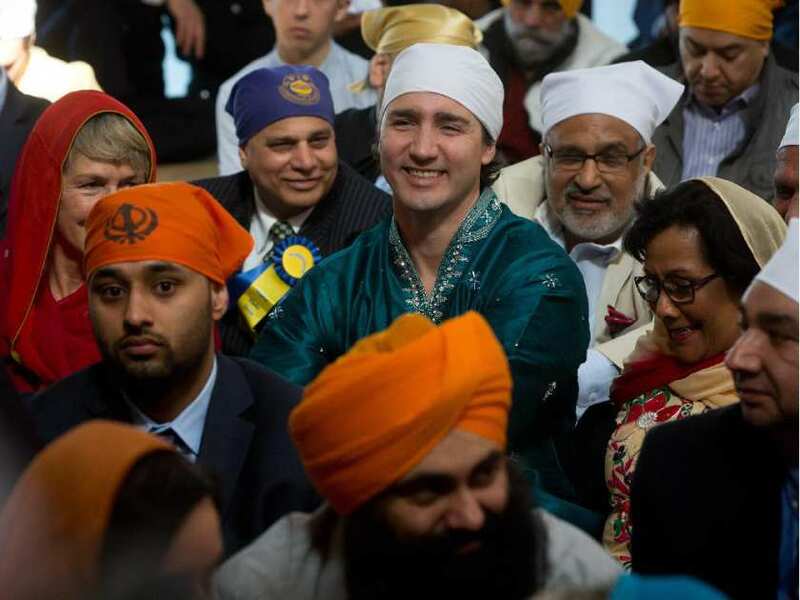 Canadians generally assume that ethnic voting is merely an expression of the ability of immigrants to become normal participants in the political process. But these liberal illusions took a realistic hit when former Quebec premier Jacques Parizeau could not but make the obvious observation that the separatists' defeat in the 1995 Quebec referendum was due to the ethnic vote. Quebec came within 55,000 votes of separation, and without the 90 percent of "new Canadians" who voted against separation the Quebecois would have been able to carve out a separate nation state. But making this simple observation occasioned widespread criticism of Parizeau, even by his own Parti Québécois, as a "shameful" remark, leading to his resignation as PQ leader. Former immigration minister of Canada Chris Alexander, encouraging mass immigration of Chinese students into Canada to replace White students and promote greater Chinese influence over Canada's educational institutions. the Canadian Alliance of Chinese Associations, an "amalgamation of 45 BC-based Chinese organizations with a shared mission to strengthen cooperation between China and Canada in economic development, trade, education, scientific research and technological development" — a group packed with "immigration lawyers, immigration consultants, immigration agents, and student visa services." Chinese Canadian Medical Society — B.C. 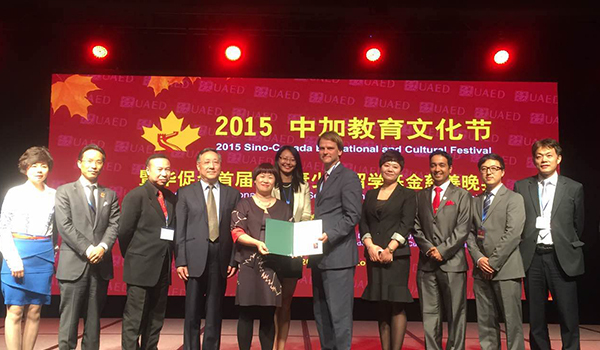 Chinese Cultural Society of Kelowna — B.C. Vancouver Chinese Canadian Youth Council — S.U.C.C.E.S.S. 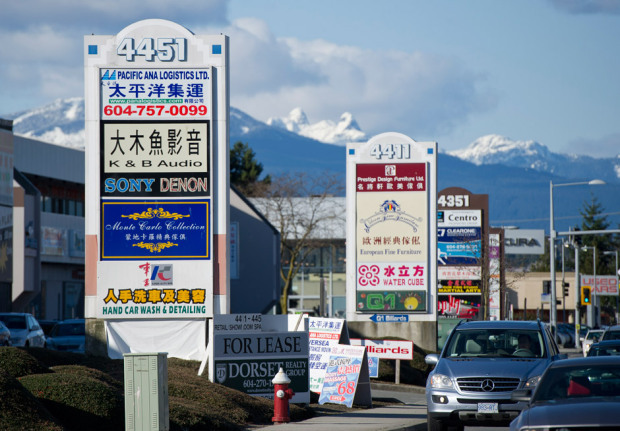 Asian associations are found everywhere in Canada. The India-Canada Association alone, dedicated to the "preservation" of Indian culture among immigrants, has centres in multiple Canadian cities. There are countless others at the federal, provincial, and city levels. It is common among White Canadians lacking any sense of collective identity to reply that there are many associations by and for particular European ethnic groups. This is seemingly true; for example, there is a list of "Italian-Canadian organizations and associations that promote Italian-Canadian community and culture within Canada." There is also a list of Ukrainian Organizations, and a list of Scottish Societies, many of which have ceased to exist. These associations, however, tend to be purely cultural. There are no British associations. The British are the most discriminated ethnic people in the world. European Canadians are prohibited from forming groups with an ethnic orientation, whereas Asians, Blacks, Aboriginals are welcomed to do so. Canadian universities are packed with Asian, African, Latin American, and Muslim clubs; see, for example, the clubs at York, Ryerson, Concordia, University of British Columbia. Meanwhile "White" student unions are prohibited, whereas racially designated unions for Asians, Blacks, and Aboriginal can be found in numerous universities. Non-European associations are growing by leaps and bounds in the degree to which immigrants coming since the 1980s are Asian, Middle Eastern, and Mestizo. If you read carefully the goals and events announced in European groups versus the non-European groups, you will sense that the latter are more racially collectivist, more dedicated to the promotion of ethnic interests. For example, one of the recent events at the Durham Chinese Cultural Centre was "Empower Women Diverse Business in Durham Region". This should come as no surprise since promotion of diversity is an official daily fare across Canada. The European clubs tend to have a relic-like character, a sentimental interest, a sense of desperation about preserving their heritage, encouraging their fast declining populations to stay in touch, focusing mainly on folksy aspects of their culture. They are senile. In short, Canada is full of non-White associations with a strong concept of the political (in Carl Schmitt's language), not necessarily in the strong friend-enemy sense, since these associations don't have political sovereignty over Canadian territory (not yet), but certainly in the sense of us versus them, since they consist of members who separate themselves from others lacking the "right" ethnic identity. How Eurocanadians react to this demographic replacement and growth of ethnic power groups will determine the fate of Canada. If Eurocanadians continue to celebrate the political among non-Whites while condemning it among themselves they will be utterly marginalized and humiliated within a few decades.